»Jaipur To Jodhpur – Nirvana For History Aficionados! Stationed in the midst of the Thar Desert, the fascinating aerial view of the city of Jodhpur is in vivid shades of blue. The hefty forts that protect the city make Jodhpur worth visiting. The fort's intricate carvings make for exclusive pieces of art. No doubt, visitors are mesmerised and awe-struck by the unmatched talent of the age-old artisans. The city's sublime beauty attracts flocks of tourists and film-makers alike. Not only this, destination weddings are a common scene in the Blue City. Big fat Indian weddings of celebrities or localites can be experienced here. What's more, cultural fests, like the Marwar Mahotsav, Rajasthan International Folk Festival and the World Sacred Spirit Festival, enliven the city vibes. Jodhpur is a perfect blend of history and the hustle and bustle of modern city life. Plunge in and explore the ethnicity of this historic marvel! October to March is preferably the best time to explore Jodhpur at its fullest. The pleasant wintery atmosphere during these months makes the environment tourist-friendly. The temperature can go as low as 7 degree Celsius and doesn't rise above 25 degree Celsius. It is a perfect time for tourists to experience the city closely. Summers in Jodhpur are dry with high temperatures. Jodhpur receives moderate rainfall in the months of July and August - an apt season for budget travellers. The temperature is comparatively low in summers. Jodhpur is also titled as the Sun City because it experiences bright sunlight all through the year, even during winters. How To Get To Jodhpur? The Jaipur to Jodhpur stretch is approximately 337 km via Route 1, 380 km via Route 2 and 332 km via Route 3. Route 1 is recommended because it takes approx. 6 hours to reach the destination. Other routes may take more time. Several trains run between Jaipur and Jodhpur. The duration of the journey can range from 4 to 11 hours. Buses take the same time, approx. 6 hours, as the road journey. Buses run between Jaipur and Jodhpur throughout the day. This mode is also the cheapest way to reach Jodhpur. Jodhpur is well connected to all major cities by air. The city centre is at a distance of 5 km. Taxis and autorickshaws are readily available from here. Ajmer: Elope to Jaipur's streets early in the morning and head towards Rawat Misthan Bhandar to enjoy the famous pyaaz ki kachori. Other varieties of delicacies to try include samosas, mirchi vadas, dal kachori, countless sweets! Lassi at Lassiwala is something you can't miss. About 135 km from Jaipur lies the chaotic city of Ajmer. Undoubtedly, the divine Dargah of Moinuddin Chishti, also known as Dargah Sharif, is a must visit! Jainism followers can visit Nasiyan Jain Temple that bags the title of being one of the richest temples in India. Apart from these, you can visit Lake Foy Sagar and Ana Sagar. Just 13 km from Ajmer, lies the pilgrimage city of Pushkar. Visit the only Lord Brahma temple in the city. It is recommended to stay over, if you have an extra day in hand, and explore both these splendid cities! Beawar, a mineral-rich city, lies in the midst of the Aravali hills. It is located about 57 km from Ajmer on NH 58. A budding city in the state, it has good road connectivity. Beawar is also the largest producer of cement. Visit during annual Tejaji Fair to feel the vibe of the typical Rajasthani culture. Drive another 73 km to reach the small town of Bilara, which also marks the arrival of Jodhpur city. Spend some quiet time at Jaswant Sarar Dam. Visit here during Nau Sati ka Mela, when villagers assemble to take a dip in the Banganga river and participate in various activities held during the festival. Drive another 80 km to reach the Blue City. Umaid Bhavan Palace:Umaid Bhawan Palace was also called Chittar Palace because the stones with which it is built were drawn from the Chittar Hill. One of the recently constructed places in India, Maharaja Umaid Singh refurbished the palace in 1943 to provide employment to the people affected by famine. 1. The area where the royal family resides. 2. An area converted into a heritage hotel. 3. A museum, where all the artifacts, depicting the sheer opulence of the Maharajas and their lifestyle, are displayed. Your trip is incomplete without a visit to the Mehrangarh Fort. One of the largest forts in India, it stands 400 feet above city limits and accommodates several mahals within. The aura of the fort is striking enough to attract both Bollywood and Hollywood film-makers. The museum is worth visiting to get a taste of the royal lifestyle of the Rathores. Seniors and other disabled people can opt for an elevator that is nominally charged to have a look around at the pristine fort. The profusely thick ramparts will definitely surprise you with their magnanimous palaces, precious artworks, intricate carvings and prodigious historic values. Couples can enjoy a candlelight dinner at the Chokelao Mahal Terrace Restaurant - a spectacular location with stunning city views! Don't miss the famous Rajasthan International Folk Festival and the World Sufi Spirit Festival that are conducted here. Located adjacent to Mehrangarh Fort, Jaswant Thada is a captivating heritage site where you can stretch, loosen up and enjoy the stunning city views. 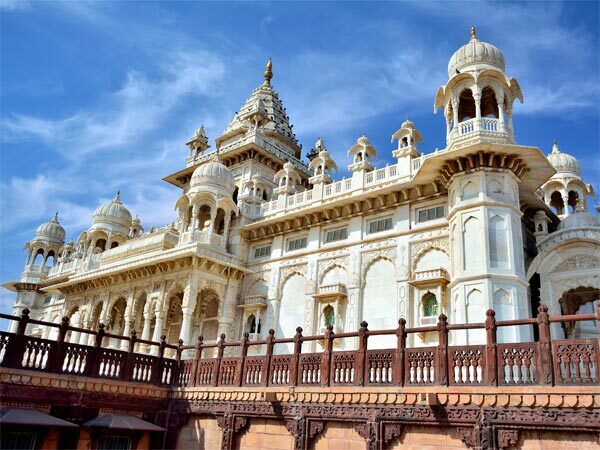 The attraction is an architectural marvel built in the memory of Maharaja Jaswant Singh. One can marvel at the intricate carvings on jalis,jharokha,pillars and mehraabs. Rejuvenate yourself in the midst of a glorious fountain or simply stroll by the pond. This cluster of noble and palatial cenotaph in shiny white marble is designed beautifully to attract appreciation from innumerable tourists visiting here. The monument is believed to grant wishes. So, go ahead, make a wish! Desert camping anyone? Yes, one can camp and barbeque in tow while some traditional music and dance goes on. You can also hop on a camel to have a distinct view of the brown ripples of the Thar. While in the Sun City, missing out on the mesmerising sunsets and sunrises will be an offence. Soak in the beauty of nature that the sands have to offer. Clock Tower, an old city landmark, is located in the heart of Jodhpur. Shopaholics can have their hands full of handcrafted jewellery, bags, traditional saris, distinct colourful fabrics and even spices! Entice your taste buds to scrumptious Rajasthani delicacies. Don't forget to grab some sweets and lassi at Mishrilal. Evenings in the area are beautifully lit and full of spicy chaat stalls. Budget traveller can enjoy several economic accommodation options.